It appears simple, but the Super-Hybrid is a highly flexible guitar, designed with players in mind and put together with panache. Best suited to players that will make the most of its flexibility. Is it a bird? Is it a plane? No, gawping bystanders, it's a super-guitar, sent to earth to prove that one instrument can, in fact, do it all. For the Fret King Black Label Super-Hybrid is no less than an attempt to combine single-coil sweetness, humbucker crunch and piezo gloss in one guitar. The Fret-King batwing-style headstock, with Wilkinson-designed machineheads, leads us onto an impeccably finished and supremely comfortable Canadian hard-maple neck, topped with rosewood and 24 medium jumbo frets. "A brief inspection reveals Wilkinson fingerprints all over the place, from a sunken jack-plug to the gentle wave along the top of the scratchplate"
The two-piece American alder body sits somewhere between a classic Fender Strat and a more modern shred machine. A brief inspection fore and aft reveals Wilkinson fingerprints all over the place, from a sunken jack-plug to the gentle wave along the top of the scratchplate. An unplugged strum reveals the Super-Hybrid to be responsive and resonant. The fun really starts when things get loud. You might need a couple of minutes' acclimatisation to get to grips with the Super-Hybrid's all-in-one proposition, but when you do, you'll find plenty of tonal options. The HSH layout, alongside a dual-purpose push-push volume control, gives you two things: a humbucker-loaded rock screamer ready to tear the face off a bearded hipster, and a bonus set of sparkling single-coil tones. It's a pleasant enough partnership played clean, but it jumps into life with a little crunch, sounding sublime through anything valve-y. "The Wilkinson-designed pickups are perfectly suited to big, bold rock leads, cultured bluesy runs and beefy rhythm-based riffery"
The Wilkinson-designed pickups are perfectly suited to big, bold rock leads, cultured bluesy runs and beefy rhythm-based riffery. But remember, this is a hybrid. The Acoustibridge, another of Trev's creations, is a piezo-loaded bridge designed to give you a whole other bag of tricks to dip into. Controlled via that push-push volume pot and three rear-mounted micro-controls, the piezo gives a pretty good account of itself, sounding what we'll dub 'acoust-ish'. Does it sound like a lovely unplugged Martin? No, of course not, but it certainly has some strum-along sparkle, and you can blend the piezo with the pickups for even more playing possibilities. 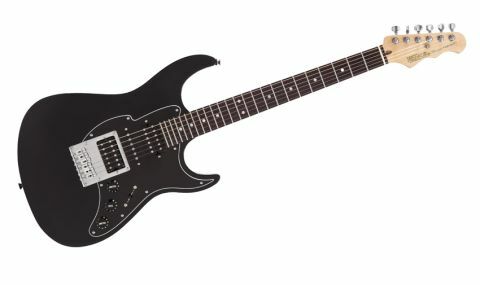 It might not have the digital bells and whistles of some of its competitors - the Line 6 JTV springs immediately to mind - but that doesn't detract from Fret-King's achievement of essentially cramming three guitars into one. The Super-Hybrid has much more going for it than appearances might initially suggest, making it an undercover hero well worth investigating further.